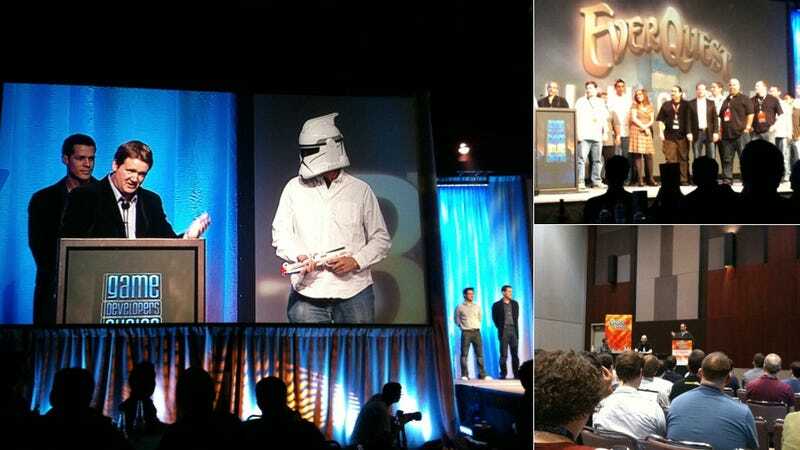 Last week, I attended the Game Developers' Conference Online in Austin. I was there to give a talk about game storytelling, but I stayed for the entire event, and caught a good number of talks, workshops, and keynotes. On Monday, Gamasutra (who helps put on GDC each year) ran a fun collection of quotes from the event, which do a great job of capturing the vibe and overarching messages of GDC Online. I thought I'd add a few of my own favorites, and share some of theirs as well. "GDC Online" is a bit of a confusing name, since it implies that the conference itself takes place on the internet. At least, when I first heard the name, what's what I thought it was—a sort of remote GDC, similar to the one held each year in San Francisco but available online. But of course that isn't the case; GDC is a standard convention, but one aimed at online games. For the most part, the talks are given by developers working in social and online games, from Facebook titles to iOS games to MMOs. There is also something going on called the "Narrative Summit," in which game writers meet to discuss the challenges of their trade and to workshop game writing. The bulk of the sessions I attended were in the narrative summit. Video game storytelling is something I'm really interested in, and I feel like sometimes I'm overly hard on game writers when they aren't actually at fault for a game's lackluster story. Often, the problem is that writers are brought in at the last minute to "fix" the game's story, and it's far too late for them to do anything more than apply a veneer of narrative over an already finished game. One of the talks I most enjoyed was the one given by Deus Ex: Human Revolution's head writer Mary DeMarle, who showed the entirety of Human Revolution's story in spreadsheet form. When Eidos was getting ready to make the game, DeMarle said, they did something very smart: "They hired me." It was a bit of a laugh line, but throughout her talk, she made it clear how integral her ground-floor presence had been to making the game have a story that was coherently crafted. DeMarle also shared that the outsourced boss fights and the somewhat tacked-on ending were both sacrifices that the team had to make due to a lack of time. "We did want to have a deeper level of choice than just being in a room and hitting a button," she said, "but unfortunately that also came down to scheduling and time." "I'm inherently super-duper lazy, so if I think of something, it's going in." Valve writer Eric Wolpaw responds when asked if he has a larger vision of his games' worlds than what players experience on screen. Teammate Marc Laidlaw agreed, saying that creating things that don't make it into the game is "kind of counterproductive." "You click through everything until it explodes with blood and treasure." -Blizzard's Kevin Martens' mantra for the upcoming Diablo III. He, along with several other writers and designers, provided a fast and off-the-cuff talk about their inspirations and what makes a great gaming moment. "Writers don't often get to sit at the adults table." -Game writer and Extra Lives author Tom Bissell calls for writers to be ingrained deeper in the development process. "A few Kotaku articles and IGN front pages do not make a hit game." -BioWare San Francisco's Ethan Levy, from an insightful and open talk about how the studio's social game Dragon Age Legends attracted a lot of temporary Facebook likes, yet wasn't a big hit. Again and again, developers shared the opinion that social games as we know them are changing so quickly that soon they will be unrecognizable. As much as those of us who prefer harder-core games may disparage social and facebook gaming, there is a sizable difference between "social gaming" and "casual gaming," and while casual gaming is in many ways similar to what it was 20 years ago, social gaming has changed significantly even in the last six months. I thought PopCap co-founder John Vechey said it best when he said, "The way we make social games is going to be different in two years. I don't know how it's going to be different, but it's going to be different." Later in his keynote, he reiterated this belief: "Everything we think we know about social is going to go away." I was impressed with how engaged many of the speakers where when discussing these games, not just about how they can make money off of them, but how they can make them legitimately fun games. The entire concept of "social gaming" is changing with remarkable speed. The rest of the conference provided some great quotes as well, from celebrated Sci-Fi author Neal Stephenson playing Halo 3 on his elliptical machine to Atari founder Nolan Bushnell, who dropped a gold mine of outstanding quotes into his talk. One of my favorites was this gem: "Everybody who's had a shower has had a good idea. The question is what you do when you get out of the shower. It is the doers who make the difference. ... An idea is due to ownership. Ownership of an idea is something that you earn; it's not something that you get. Having an idea is not even the first step." All in all, it was a very cool week, and refreshing to hear so many game creators talk candidly about their trade, away from the hype and PR spin of press events.